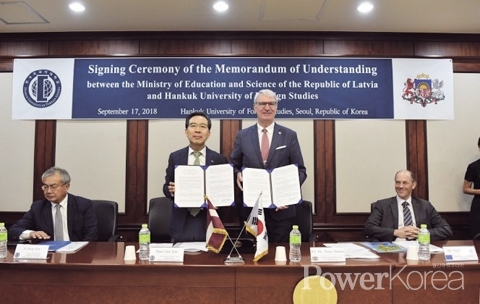 Hankuk University of Foreign Studies and the Latvian Ministry of Education and Science signed a MOU to promote Baltic studies in Korea. The signing ceremony was held at the university on 17 September 2018 with H.E. Peteris Vaivars, Ambassador of Latvia in Seoul, and Hyun Taek Kim, Vice President of Hankuk University of Foreign Studies, attending as the representatives for the signing. Latvia and South Korea have seen an increase of cooperation in many fields and the signing this time is expected to play a significant milestone in terms of promoting Latvian language and Baltic studies in Korea as well as cultural exchanges between the two countries. As a result, opening Baltic-related studies as part of the curriculum of Hankuk University of Foreign Studies in the future has become highly probable. In fact, Hankuk University of Foreign Studies has been running two new optional courses 'Baltic Studies' and 'The Latvian Language' since 2 March 2018 and these new courses have attracted keen interest among students. Ambassador Vaivars is certain that these new subjects and the signing of the memorandum are yet another proof of the steadily increasing interest among Koreans in the Baltic region and their commitment to ever closer cooperation with Latvia.